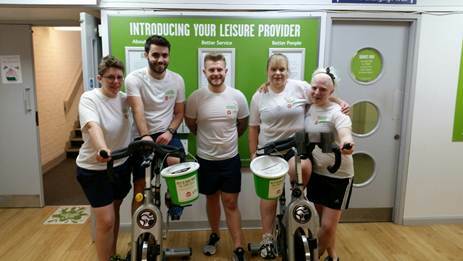 Staff and members at the Windrush Leisure Centre got on their bikes to raise more than £900 for charity. A total of 53 people saddled up for the 24-hour Spinathon with the all-night vigil maintained by five intrepid members of staff aiming to raise as much cash as possible for Sport Relief. The impressive total will go towards a target of £500,000 which Better, operator of the Witney-based centre owned by West Oxfordshire District Council, hopes to raise for Sport Relief nationally as the charity’s official health and fitness partner. Windrush LC Sport Relief Spinathon 2016Cllr James Mills, Cabinet Member for Leisure & Communities at West Oxfordshire District Council, said: “This was a fantastic effort by everyone involved to raise such a large sum of money for a great cause. Sport Relief brings the entire nation together to get active, raise cash and change lives. The money raised by the public is spent by Comic Relief to help people living incredibly tough lives, across the UK and the world’s poorest communities. The money raised by Comic Relief, through its fundraising campaigns Red Nose Day and Sport Relief as well as other initiatives, is spent at home in the UK and across the world to help people, families and whole communities stand on their own two feet.